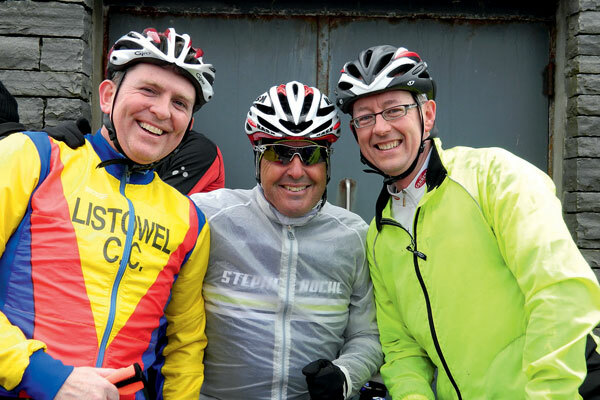 It was cold for the Stephen Roche Atlantic Challenge in Lahinch on Easter Sunday, but at least it was possible to dress for that. Less manageable was the wind, which was strong enough to rock the Velominati Team Bus (sponsored by Dolmen CC) as we sat inside having our pre-race Darjeeling and jaffa cakes. It’s a fact that Burren cyclists are the best dressed in the peloton, but an ugly tea stain does not sit well on the rippling thighs of our Santini bibs. In future such calamities could be avoided if saucers were provided. It’s quite a nice feeling to roll past Lahinch Golf Club and catch a glimpse of the boys taking their trolleys for a walk. Someone shouted “crazy mo-fos” and I didn’t know whether the call came from the cyclists or the golfers. The road surface here is wonderfully smooth and we were blown along towards Liscannor where, because Mass hadn’t yet started, we rolled with abandon. Not long after, the offence of the cliffs of Moher began and many of the foot soldiers faded as though picked off by that cruel sniper Private Gravity. No longer did we roll with abandon but were abandoned as Mr Roche and the skinny lads disappeared up the hill. I wasn’t so much chewing the handlebars; for a while my head was almost underneath them and my jaw in danger of hopping off my knee. There was no moment of repose as we crested the cliffs. It was ‘slap it into overdrive’ time and take out the skinnies. What a shock I got as we descended towards Doolin. I could see a guy in front of me moving forward but leaning almost 15° off vertical to counter the effect of the wind. I pitied anyone caught on their own for that stretch of road. It only got worse as we reached sea level below Ballynalackan. It took an age to pass through Fanore. Grind, grind, grind. One became two and two became three as we picked up strays; we may have been 10 as we rounded Blackhead. We each took a short stint at the front, and I remember not wanting to drop to the back in case I was lost. It was comforting knowing there was somebody behind; without them, I felt like a climber without a safety rope. We reached Ballyvaughan and I knew we weren’t going to stop. At the top of the corkscrew hill out of Ballyvaughan, I met a West Clare jersey and we began a chase that lasted all the way to Lahinch without a word being spoken. I didn’t know Dathai Queally had a voice until we reached Lisdoon. We raced to the climb at Kilshanny, the first time my legs felt heavy. You think all your work is done when you’ve ticked the Cliffs box and the Corkscrew box but Kilshanny can surprise you. It was a hard day on a bike. It was dry – a bonus for Co Clare. The wind blew – typical for Co Clare.